"Best Dermatologist & Hair Transplant Surgeon in Delhi"
Dr. Kavish Chouhan is the Director & Co- Founder of DERMACLINIX, and is considered amongst the best dermatologists and hair transplant surgeons in Delhi, India. 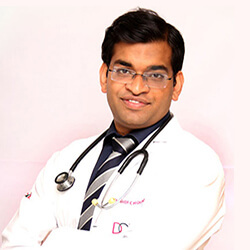 He has done his MD in Dermatology from the prestigious All India Institute of Medical Sciences (AIIMS), DELHI. He had worked in the renowned Post Graduate Institute for Medical Education and Research (PGIMER), Chandigarh. He has years of experience in hair transplant surgeries. He has successfully performed more than 5000 hair transplant procedures by FUE technique till date. Also, he is specialized in performing successfully megasession & gigasessions of hair transplantation by FUE. He has upgraded his skills by following tips of the world’s top hair transplant surgeons like Dr. Alex Ginzberg (Israel), Dr. Shapiro (USA) etc. He has been involved in teaching many postgraduate students the art of hair transplantation as well. He is amongst those Indian Faculties who were invited to take lecture in the prestigious ISHRS (international society of hair restoration surgery) 2013 Meet in San Francisco, USA on “HAIR TRANSPLANTATION BY GIGA SESSION (>3500 FU) FUE”. He has also taken guest lectures in various national & international conferences like AAHRS/HAIRCON 2013 in Banglore, Pigmentricon 2013 in Goa, World congress of dermatology 2010 in South Korea, DERMACON 2012 in Gurgaon etc. He is amongst the pioneers of PRP (Platelet rich Plasma) treatment & PRP-ACell for hair fall in INDIA with >7000 PRP done over last 7 years. He has several publications in indexed journals like Lancet, British Journal of Dermatology (BJD), Clinical & experimental dermatology (CED), JCAS etc. He is a qualified physician member of ISHRS (International Society of Hair Restoration Surgery) since 2010. Our hair transplant doctor is also a member of ISDS, ISD, MMDS, IADVL, PDS etc.